When I received my copy of Isa Chandra Moskowitz’s Veganomicon, I immediately scanned through the center section of the book with color photos and my eye went straight to something called a “Chickpea Cutlet.” I flipped to the recipe and the ingredients were an odd yet intriguing concoction of, among other things, chickpeas, vital wheat gluten and spices. It sounded strange enough to try and I’m glad I did. These cutlets have an amazing texture and flavor—they even enthusiastically passed my husband’s taste test. I’ve made these cutlets several times, tweaking the sides and sauces and, this trio, which we enjoyed last night, hit the mark. 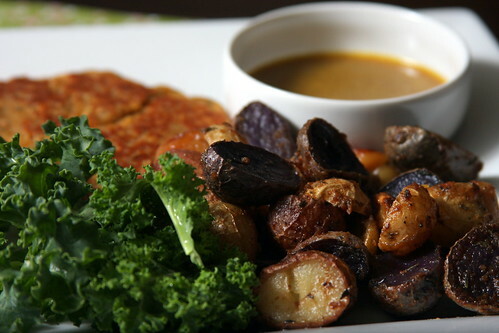 Roasted, glazey mini-potatoes with whole roasted garlic cloves and an agave mustard sauce complimented the cutlets perfectly. Preheat oven to 425. Whisk together all first six ingredients in a medium-sized pyrex dish. Add in the potatoes and toss until well mixed. Cover with aluminum foil and place in the oven for 25 minutes.While you are waiting for the potatoes to roast, make the chickpea cutlet mixture, by first mashing the chickpeas in a bowl with the olive oil. Add the rest of the ingredients and combine well with a Kitchen Aid Mixer for 3-5 minutes. Form into 4-6 cutlets. Once your potatoes have roasted for 25 minutes, remove the foil and place the potatoes back into the oven for 20-30 more minutes, giving them a good stir every 10 minutes. They are done when they are carmelized and slightly browned around the edges, but not burnt. When your potatoes look like they have about 10 more minutes to go, begin frying the cutlets in a large skillet over medium high heat, about 6-7 minutes on each side. In a separate large saucepan, place the kale and soy sauce and saute over medium high heat for 5 minutes. Serve immediately with the agave mustard dipping sauce. That is one beautiful plate of food. I love chickpea cutlets. I always have to make a double batch because they go so fast. This looks beautiful! I will definitely have to give this a try for my next fancy family dinner party! I think my dad would love this! Thanks Lauren! My omni husband LOVES these! Hmmmm… I have no idea what's going on then! I've always pan-fried them, and they've turned out great, so maybe that is it!